I am a real fan of Italy and its food, but until now I didn’t know the southern parts of the boot-shaped country too well. That changed this year when I spent two heavenly weeks in the charming Calabrian town of Tropea (situated on the knuckle of the big toe if we stick to the boot analogy). The first shock was the green and abundant landscape – I had previously imagined it to be scorched and brown – and the second the crystal-clear waters. Calabria is renowned for its agriculture, and can boast several specialities, of which I shall mention the most famous. 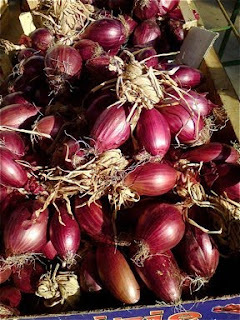 We have to start with the “Cipolla rossa de Tropea” – the red onions of Tropea (right). These are mild and sweet and can be eaten raw or cooked, and in fact the affix “alla Tropeana” in menus simply mean that it is prepared with these red onions. And they are seriously GOOD! The locals are also fond of spicy food, and grow several types of hot peppers (Pepperoncini), and I can recommend the pointy, red, thumb-sized type they sell on strings, or the green, round, egg-sized ones that are fresh on the market in July/August. It is one of the primary ingredients in a very special form of sausage that originally came from the mountain village of Spilinga, just up and behind Tropea. We talk about Nduja (word originates from the French Andouille) which is a soft, smoked sausage made from pork fat and meats, chilli and red peppers, and it comes in various degrees of hotness. It is delicious, and used in hundreds of recipes, the affix “alla Nduja” will give the game away! The Calabrians are indeed fond of their meat, even if it is very much a seaside country. 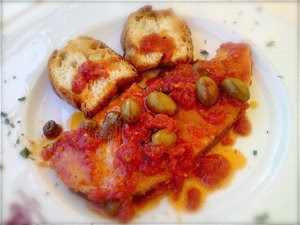 Among their favourites from the Mediterranean is the swordfish (pesce Spada) which comes grilled or with various toppings, in Scilla I enjoyed it with tomato, capers and olives (lower right). 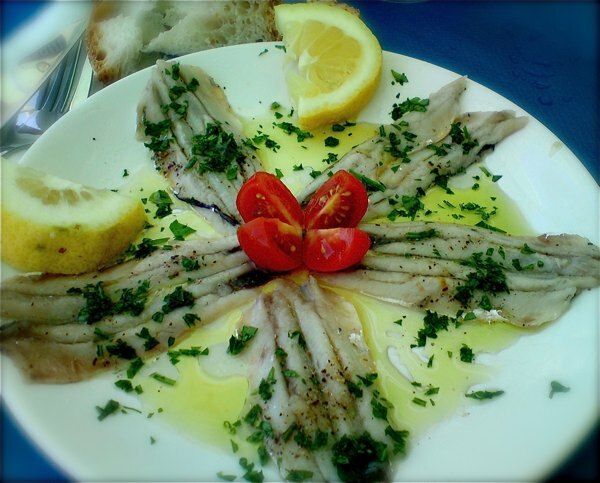 Fresh anchovies (Alici) (top) are another favourite, I have had them headless, gutted and deep fried, or marinated and filleted, and they are delectable whichever way. Of course, the salted fillets are also a staple of the local kitchen, and they are often added to sauces where they simply melt away and impart an extra yummy savoury flavour. Caper (Capperi) is of course another local ingredient which is much loved. The creeping or often hanging Caper bush (Capparis spinosa is the botanical name) can be seen everywhere, and its beautiful white and purple flowers would be reason enough to grow it, but it also gives us its flower buds (for caper buds) and its fruits (for caper berries). They are sold pickles in salt, usually, and not in brine as we are more familiar with. The local cheese of favourite is the Pecorino, made from sheeps milk (pecora means sheep) and it is sold in all grades of maturity and with various additives, and it is used in recipes much like the parmeggiano or grana padano is used further north. Dagfinn Sigridsson Skoglund is 50 years old (forever) and is living in a studio apartment in downtown Oslo. He is working as a designer and art teacher, and is an excellent cook. Dagfinn is a passionate lover of music, botany and is an experienced traveler - and he hates popcorn!